Loved the way it turned out from this styled shoot at Project Obscura near Las Vegas. Project Obscrua was a two day intensive workshop for wedding and portrait photographers around the world. We spent one day just shooting on locations non stop. Unlike any other typical Vegas weather, we got to experience snow, sun, and blazing cold wind all in one day. As a result, this is one of the many stunning images I got to produce at Spring Mountain Ranch State Park. As an infamous Los Angeles wedding photographer Michael Anthony instructed, we always need to shoot with a purpose and story in mind. And with this image, we are trying to narrate a story of a newly wed that just eloped. We had the couple running down a desert path. 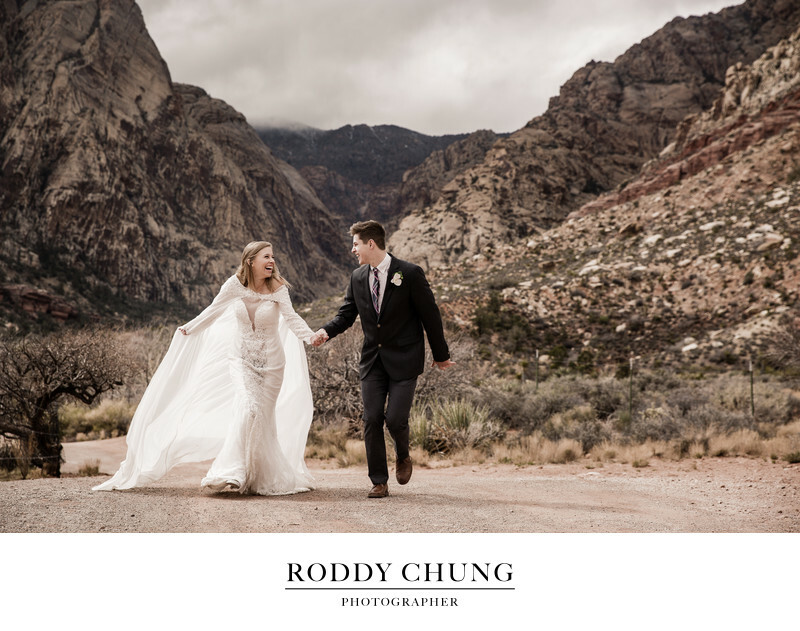 With the rocky mountain in the background, it emulates a scene of the couple running towards their honeymoon. It was playful but still elegant, and most importantly, it maintains a timeless feel. It's not every day you get to photograph in a gorgeous location like this. The desert gave me so much room to play around with. It was absolutely a photographer's heaven. I would totally come back myself sometime in the near future. Location: 6375 Nevada 159, Blue Diamond, NV 89004.